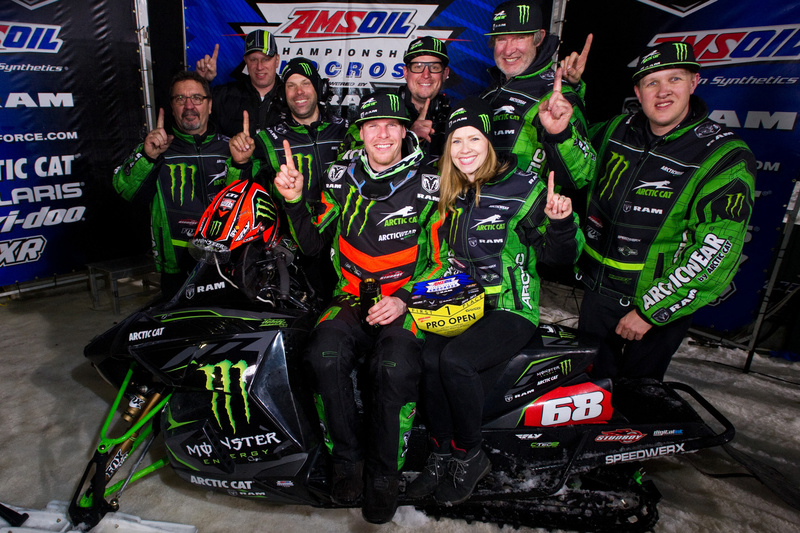 Monster Energy / Arctic Cat / Ram Truck’s Tucker Hibbert took home a win and held onto his commanding lead in the Pro Open points championship chase at the Ram Truck Snocross National in Mt. Pleasant, Mich. For the second consecutive year, central Michigan’s Soaring Eagle Casino & Hotel featured a big, technical track for rounds 13 and 14 of the ISOC National Snocross tour. 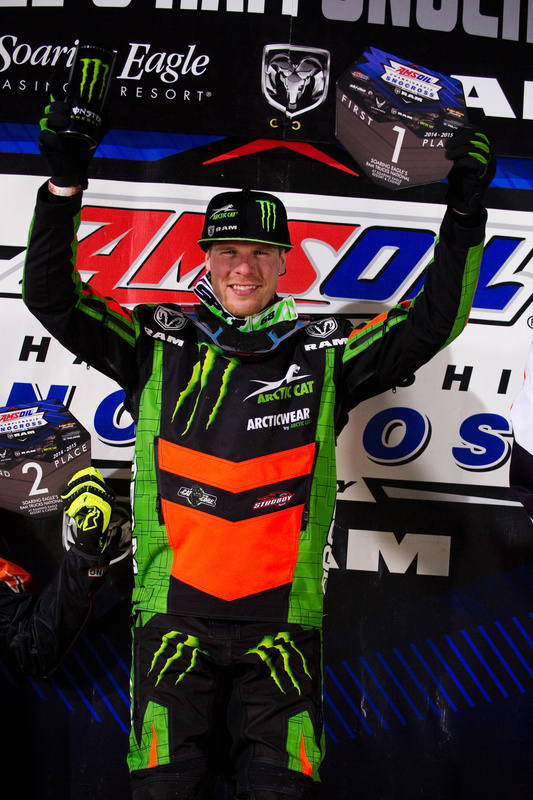 Hibbert entered the weekend on a five round win streak and continued on that path Friday by winning both his qualifying races and the final event. Saturday began much the same as he won both qualifiers to lock down the number one start line pick for the final event. Saturday night, Hibbert launched off the line in the 15-rider, 14-lap final to take the Stud Boy Traction holeshot and early lead. Riding smart and smooth on the quickly deteriorating track, he extended his gap over second place with each lap that passed. On lap nine, he cased a jump in the downhill rhythm section, was ejected off his sled and sent tumbling down the middle of the track. He didn’t waste any time getting up and ran to his sled but found it wedged in a corner of hard plastic banners and tuff blocks. Two laps passed before he was able to untangle his sled and reenter the race. He rode conservatively the remaining laps to salvage a ninth-place finish. The ISOC tour will take a weekend break before entering the final stop of the 14/15 season in Lake Geneva, Wisc. With three full days of racing on tap in Lake Geneva, there are still 135 points up for grabs in the Pro Open Championship. Hibbert now holds an 89-point lead over second place and is in a solid position to clinch his ninth national title.